This is a wonder tube microphone. It is excellent for recording vocals and acoustic instruments. It has a warm sound and an a wide dynamic range. I bought this a few days ago. The price was right. I was happy to see it came with a shock-mount and is all in a nice sturdy case. Of course I had to try it on a vocalist first. It made the recording clear as a bell. It also brought out some nice warm tones. Once I added a bit of compression, then some EQ, and it sounded amazing. 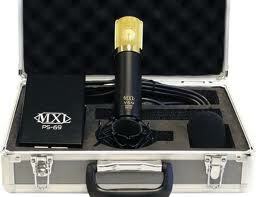 MXL has really become a solid company for microphones. When I was in school for studio recording, our professor used to tell us that MXL microphones are just as good as some really expensive microphones. He was right. It is frankly a beautiful microphone. The gold plated grill looks amazing. It sells for $300 at Guitar Center. Click the link below for exclusive deals.